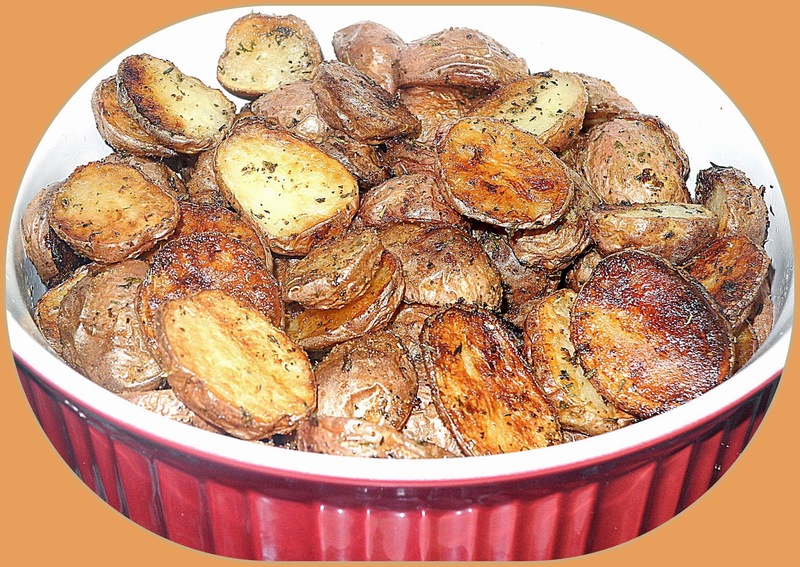 Ever since I discovered the delights of crispy potatoes, I have been trying different recipes, looking for the best. This time it was a recipe by Curtis Stone. This recipe held up to its name, "crispy roasted" and was soft inside the potato. The recipe calls for garlic but because hubby gets sick from it, I had to omit it. I suggest that it be included to give it even a fuller flavor. Place the oven rack in the lower third of the oven then place a large, heavy baking sheet on the rack. Preheat the oven to 425°F. Cut the potatoes in half lengthwise. In a large bowl, toss the potatoes, oil, thyme. Season with salt and pepper. Remove the hot baking sheet from the oven and arrange the potatoes cut-side down and in a single layer on the baking sheet, scraping all of the oil mixture over the potatoes. Return the pan to the lowest rack in the oven and roast the potatoes until they are crisp and dark golden brown, turning as needed, about 55 minutes.